Best One Cup Coffee Maker Reviews – We do love our coffee – so no wonder the reviews for the best one cup coffee maker are so popular. Coffee has become an essential – but nonetheless, beloved, daily ingredient in so many of our lives and with such a competitive market catering for such a vast crowd with varying tastes in brand, design, capacity, versatility and all those little added features, it can be very overwhelming; especially when all your heart desires is one simply made cup of coffee. And if that’s you, then you’ve come to the right place. What is a One Cup Coffee Maker? As the name suggests, one/single cup coffee maker simply brew one cup of coffee – personally suited for you, whether at home or on the go; without all the hassle of making a whole pot. Convenience – the biggest benefit when it comes to the single cup is definitely how convenient the whole process is. No wasted time or added fuss; you simply brew a mug-full ready to get on with your day! Simplicity – what’s great about these machines, is how simple they make the process. They are ideal for customers who want coffee without all the added buttons and dials, which let’s be honest are often more suited to futuristic aerospace technology…anyhow it will do what you need it to do; quick and easily. Affordable – the simplicity of the models also means the price ranges are more limited and you can find extremely affordable solutions purpose-built to fix your coffee-needs, problem solved! Simplicity at its finest! Keurig, a respected name in the coffee making business have produced this petite, easy-to-use, easy-to-clean model for those who’d rather not mess around. 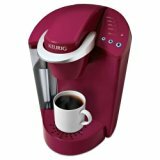 → Get the Keurig K-Cup In Room Brewing System on Amazon! With this Hamilton Beach Single Serve Scoop Coffee Maker – versatility is everything. 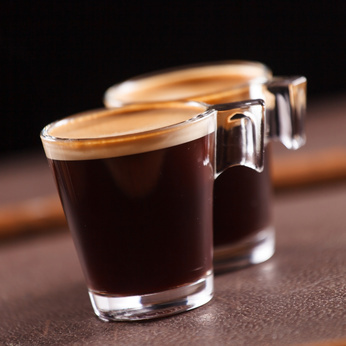 It simply gives you the choice of flavour, strength of blend and brand of coffee – exceptionally brewed, with very little hassle and for an affordable price. Aesthetically modern and sleek design, which means this little addition, will blend in nicely in any modern kitchen as well as a durable stainless-steel construction. It’s even got guidelines on how much ground coffee to scoop and caters for your regular morning fix as well as (in case you kept hitting snooze) a travel size mug so you can get on with your day! → Get the Hamilton Beach 49981A Single Serve Scoop on Amazon! It’s an Elite Brewing System – the name really does say it all! This Keurig K45 will adapt perfectly to whatever purpose you wish. With three serving capacities, a range of beverage options including hot cocoa and iced beverages and even a choice of colours including rhubarb and coconut white – what more could you ask for?! However, it does come with an elite price label to match. But overall, it is quality you’re paying for; it’s quiet, fast and ready to go when and how you need it. 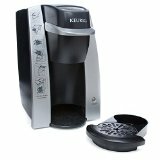 → Get the Keurig K45 Elite on Amazon! This Coffee Maker has been literally tried and tested. Said to have ‘survived’ a dishwasher and…a microwave. Said to make the largest cup of all the other affordable makers. Said to include a mug with room enough for even the manliest shaped fingers. It’s cheap, lightweight – everything is made of plastic, and durable – ideal for the ‘single coffee drinkers in the house’ among you that are just in need of coffee. → Get the Kitchen Selectives on Amazon! Coffee for one please! Looking to get to the bare bones of self-coffee-brewing, then we’ve got something to offer. If you’ve read the reviews, I think this Hamilton Beach Personal Cup One Cup Pod Brewer could be a pleasant surprise. 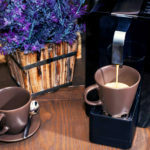 Nothing much to look at; and with a little (extra) patience, this coffee maker produces great tasting coffee – said to be comparable to the likes of Keurig, for an extremely affordable price. It’s worth a try – even just out of curiosity. → Get the Hamilton Beach 49970 on Amazon!